It took me a month of negotiations in Italian to convince the fine gentlemen at Medagliani in Milan to send me a garganelli comb over the Alps. Not that they are expensive, with their €15, but they just don't ship outside Italy. «Nobody wants these things abroad» explained Simone Medagliani. But once I had arranged shipping and collection at their shop, they were happy to process the payment, prepare a little parcel and wait for my man to show. 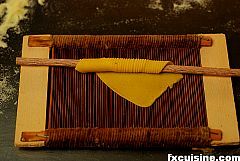 And a week later, I received my pettine per i garganelli or garganelli "comb", a diminutive wooden kitchen tool indispensible to make one of Italy's most intriguing pasta. 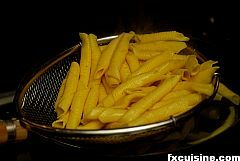 Garganelli [garga-nay-lee] are homemade combed penne from a grated Parmesan, nutmeg, eggs and flour dough. This is gorgeous pasta but you are unlikely to ever eat freshly-made artisan garganelli anywhere, even in Italy, because they just require too much work. But you can make them yourself! Let me show you how. Make a little volcano with the flour and sprinkle with a pinch finely grated nutmeg. Break the eggs into the volcano, making sure they all stay inside. You wouldn't want this gluttoon's volcano to spit egg lava into your kitchen drawers. 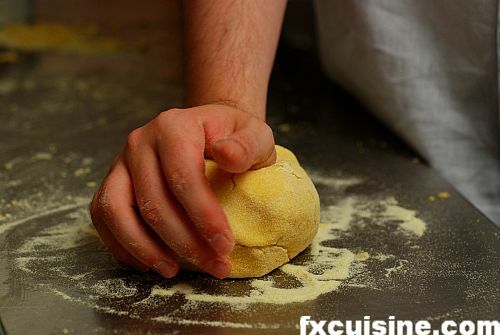 Add the grated Parmesan and start mixing the eggs with the flour with no concern for getting your hands dirty - all with finally find its way back into the dough ball eventually. Squeeze the dough on the bench with the heel of your hand, then shape it back into a ball. Continue for about 10 minutes until the dough is smooth, homogeneous and silky. Wrap it in a plastic sheet and leave for 30 minutes in the fridge so that the gluten can rest and the water make its way to the tiny bits of dry flour left into the dough. We now need to make very thin sheets of pasta dough. 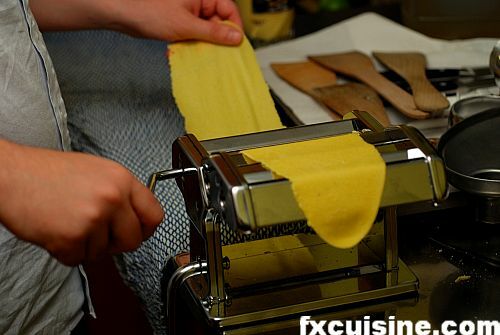 If you have one of this hand-cranked pasta laminators Italians call macchinetta [mahkeeNAYtah], just pass your dough bit by bit through the machine and finish with the next to thinnest setting. Otherwise, just use a long rolling pin on a wooden table like a real Italian mama. Let the fun begin. 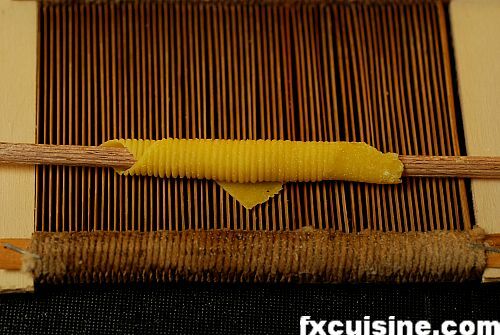 Cut your pasta sheets into 5cm/2 inches squares and using the supplied miniature rolling pin, roll each square on the garganelli comb with the pin positioned from one corner to the opposite corner so that the finished garganello will have two pointed tips. As you see the comb is rather simple tool, cheaply built and you could probably make one yourself. After a few tries, you'll probably be able to roll two garganelli at the same time. Great fun and a truly memorable moment in any kitchen! 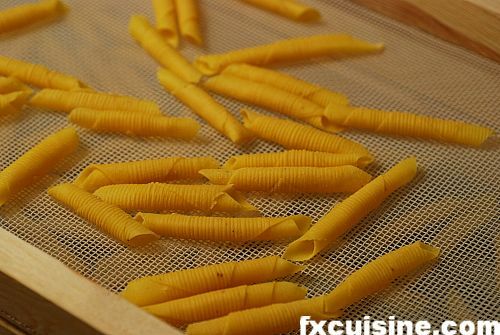 Let the garganelli dry a little either on a clean, dry towel or on a wire rack. Here I used special cassetti asciugapasta 'pasta-drying drawers' racks you can stack on top of each other I ordered from Italy. Sounds very fancy but they cost only about 10€/15$ a piece and let you dry pasta without taking too much kitchen real estate. Fill the largest pot you have with water, add a tablespoon of salt and bring to a rolling boil on your hottest burner before plunging the garganelli in the water. 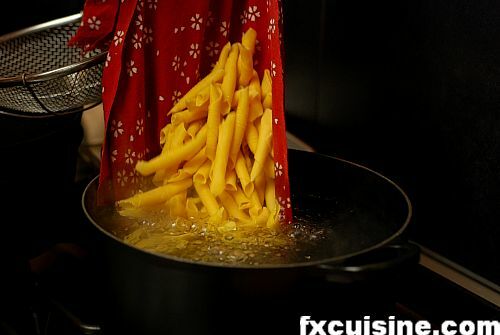 The cold pasta will stop the boil - that's not too good if it lasts more than a few seconds and we try to avoid this by using a large quantity of water and a very strong burner. Taste a garganello from time to time and fish them out with a large sieve as soon as they are almost cooked but still retain some bite. They will continue to soften a bit in the sauce, so err on the side of rawness. Italians are great innovators, but when it comes to pasta tradition holds them firmly in place. Each pasta sauce has its authorized pasta shape and deviation is frowned upon unless you are a successful chef. 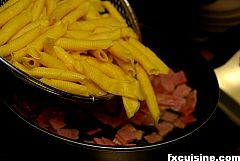 Garganelli are traditionally served either with a green peas and ham sauce, or in a cream and ham sauce. I bought myself three nice thick slices of artisan cooked ham and tonight, we'll eat our garganelli with the ham-and-cream sauce. Cut the ham into 1/cm/0.5'' squares. You may discard the white fat on the sides as more fat is on the way. 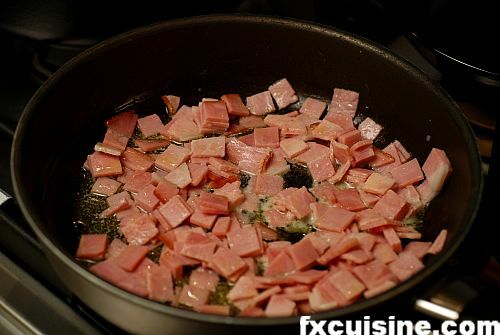 Gently melt the butter in a deep frying pan, then add the ham squares. If you use thick cream you can put the garganelli before the cream as it won't need any thickening. 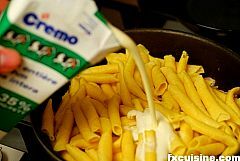 If however your cream is runny, pour it into the pan and let it reduce as long as needed to get a sauce that will coat the pasta nicely. Then add the garganelli and mix well. 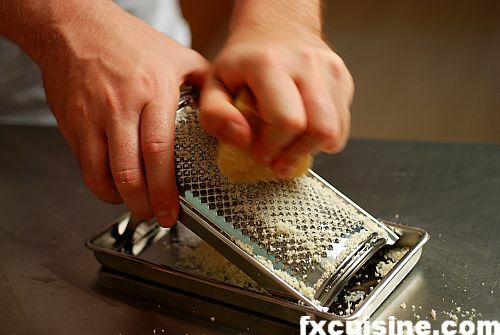 Serve with the rest of the grated Parmesan. Not a quick-fix dinner, but what a treat! The pasta itself has a delicious parmesan-nutmeg flavor and is bity and strong to the teeth. I've been wanting to make this pasta for years and this little parcel from Italy with the garganelli comb really made my day! Looks delicious although I would probably had made another sauce... what is it with Italians and traditions when it comes to food anyways? I saw an episode with Jamie Oliver where he cooked on the streets in an Italian town and he had a hard time giving his herb baked fish away for free.. because they didn't cook fish like that there. Well Italians are pretty creative too including for cooking, but if you do a traditional dish, then they will go for the traditional way of making this dish, even though each family might do it in a slightly different way. As for Mr Oliver, I think if Italians don't want to eat his food even for free, it says more about the way he cooks than about Italy. One of the fun recipes. But they are all fine. I gave the link to the Milan shop that made my garganelli comb in the article, and that's the only place I fond that sells this. Perhaps you can try to make one yourself or if you travel to Italy find one there? CAN YOU HELP ME,WHERE CAN I FIND A LITTLE HOME MADE MACHINE FOR GARGANELLI? Wow. You are right, that garganelli comb is very hard to get I even ask people to try to find one for me in italy but it was very hard also for them. please if you know a way to grab one I would love to know I can't get the shop you posted to help me. I even ask for four of them. Please let me know if you have more info on the combs. I will take a couple. Thank you. I'd also like to by a "comb" (even second-hand), or at least, learn how to make one for my self! Please let me know if you find a store that delivers by mail. if I would like to give these noodles as a present to s.o., can I easily just let them dry or will they spoil at some point of time? FX's answer→ Anna unfortunately you need a controlled environment (a machine really) to dry pasta without having them break. But I've read about people who freeze it. You'll have much more fun by preparing the pasta right in your friends' home with them, they'll certainly remember it for long! Great recipe! I can't wait to try it. Note to all looking for the comb...I found it on Fantes.com. They carry all sorts of unique imported kitchen items. FX's answer→ Jennifer, this site Fantes.com seems great, they even have US-made chitarras, they look a whole lot stronger than my Italian one. Great find! The Italian Post system isn't very reliable, I'm glad you got your comb. When I lived in Italy, a friend of mine had a girlfriend in Switzerland. She sent a care package everyday for 30 days (Christmas thing), my friend only received 14. FX's answer→ Oh yes, I wouldn't even consider Italian posts, you need to use a courier service. I am trying to purchase the garganelli comb from the Madagliani website do you have any advice for me? I missed out on purchasing one from Fantes bring the Christmas Holiday. FX's answer→ Vincente, it is not an expensive nor especially well-made utensil, if you can't get it from them you might think about building a substitute from other materials. Hey there. that looks amazing, where did you order that comb from i am very interested in getting one, also do they sell chitarra combs. do you have your own restaurant i think i could use a gnocchi comb two what do you think of that idea. if you are from toronto you should come down to georgebrown because the school is showcasing the italian program in the restaurant this year. Thanks for the tasty recipe. Unable to find a proper garganelli tool, I improvised with the end of a thin wooden spoon against the back of an old egg slicer. Not quite picture perfect, but not too shabby. A decilitre is about 3 1/2 liquid ounces, American, so 2.5 dl. , would be approximately 8 ounces and perhaps a tiny splash. The cream is in the sauce, not the pasta, so is not so critical as to exactness. In the absence of either a special comb or even a gnocchi shaping board, I would suggest trying a sushi rolling mat or even a (very clean) piece of matchstick blind would make a reasonable substitute. 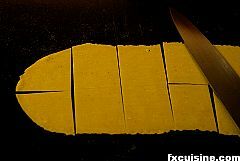 A cut down wooden spoon handle or a length of dowel would substitute for the pin - won't have the grooves, but will work just fine. Hope this is helpful. For shaping gnocchi I have used a brand new Afro-pick type comb and used it with great success - not perhaps wide enough for this pasta application, but maybe worth a look. I had the pleasure of having Garganelli with Funghi Trifolati at Mario Batali's Babbo in NYC the other night as part of a pasta tasting menu. It was absolutely to die for. I have been dreaming about it ever since. I have a shipment on the way that includes these exact garganelli combs. I should have them next week. There is a link to the store(please excuse the ebay store as my website is under construction) in my blog. So why have you never shown me this artifact or MADE me this meal? FX's answer→ Whosever dad you are, you are right to ask your offspring to make you this. 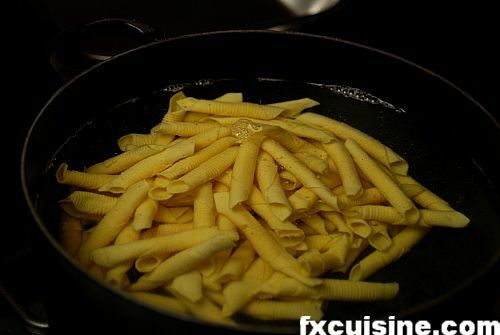 gorgeous!i will try these garganelli,your post is very atractive! OMG I have been trying for months to get the garganelli comb. I went to Scott's site ( above) naturally sold.. 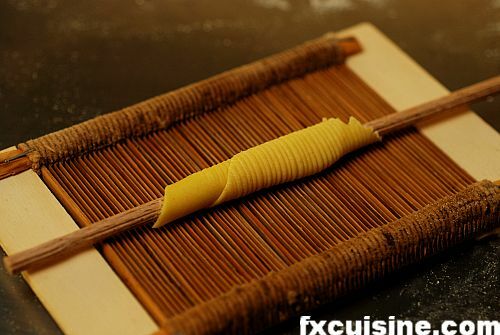 I soo love the traditional pasta tools.. I make pasta every week.. So tired of making straight everyday pasta.. I want to make handmade shapes.. I did just learn to make bow ties though by hand! I want a garganelli comb soooooooooo bad..Please Please someone help!!!! I am intrested in your cassetti asciugapasta 'pasta-drying drawers' Since I'm not going to italy any time soon..I'm going to have someone try to make one for me..
Would you be so kind as to give me the dimensions of yours so that I can have one made? How much pasta does one drawer hold about..Perhaps two would be better? FX's answer→ The dimensions are not important, all you need is make some frames and cover them with a wire mesh. Better yet, make those frames stackable. I found a garganelli comb/tool on Amazon.com. It is a "garganelli and gnocchi stripper" for $10.14. I think your site is wonderful, but who is Scott that was able to get a garganilli comb. I know you can't give me their email, how about giving my name to them. I would love to get an authtentic one. Thank you very much. This is very similar to pasta my Hungarian grandma makes. It's called csiga (pronounced chee-gah), and uses salt for flavor, not nutmeg and parmesan. She uses a wooden board with grooves in it, not a comb. Each square is 1"x1" and she puts it in chicken soup. It's delicious! We tried your recipe without the garganelli comb, sadly I now have to make a comb. Despite the lack of the comb, the pasta and sauce have been put down as another memorable meal to try on friends. Yes to make the pasta is labour intensive but was still fun and well worth the effort, just have to add a bit more than a pinch of fresh nutmeg next time, otherwise it was superb. Thank you. As a woodworker I think that it should be a simple thing to create an ersatz garganelli comb. The finished product seems to be less that 6" x 8". I would cut a piece of 3/4" maple a little bigger than that and after leaving 3/4" to 1", I'd run it over my router table fitted with a vee tip bit set to cut an 1/8" deep groove. I would then move the indexing fence back 1/8" and repeat and repeat until 3/4" to 1" remains. Sand lightly and oil with a salad bowl oil. Now cook. Could you suggest a way to purchase the wire mesh drying racks you photographed. I found a site where they sale the garganelli toll, is in Sonoma California they carry two vertions the original from Italy, and the USA one. The web is artisanalpastatools.com. I hope this place be of any help. Good day! FX's answer→ Yes lots of interesting cookware they sell but I seem to remember that the lady does not ship overseas for reasons best known to herself. Maybe this is changed! Hello! First off, thank you so much for posting this detailed recipe with great photos! I'm truly impressed. I actually made this dish once, but used Rusticella d'Abruzzo Casareccia pasta, as I was really attracted to the sauce but didn't have the garganelli comb. 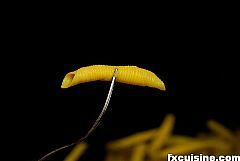 Anyway, I have a comb now, so on Wednesday it will be fresh garanelli day for me! However, I need a small clarification from you on something I noticed in the instructions. 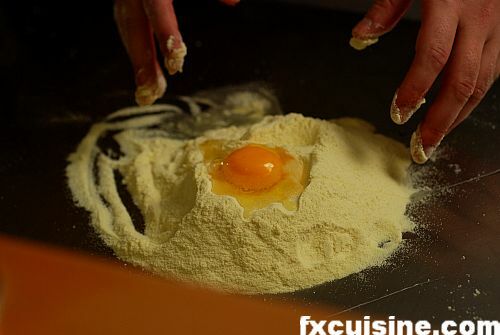 You say "Add the grated Parmesan and start mixing the eggs..." at the point where you make the pasta dough. To me, that means "add the whole 100g". 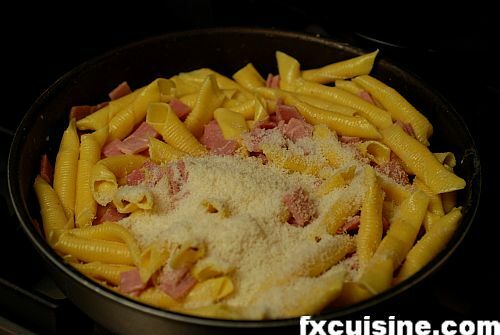 However, later just before the final picture you say "Serve with the rest of the grated Parmesan." Would you be so kind to clarify how much of the 100g of Parmesan you add into the pasta dough? Thanks so much!!! Love your website and posts! FX's answer→ I think this is a very good tip, the rigagnocchi would work quite well if the ridges are not too deep. Thank You for the inspiration of making this pasta! Im holding on to my roots! I used a fat knitting needle on my cavatelli/gnocchi board I had bought in italy way back and it worked pretty well! so glad i "accidentally" found your wesite! grazie mille! FX's answer→ Glad it worked for you, Francesca!